Anti-austerity left-wing party Syriza is heading for a substantial victory in Greece’s general election, official projections say. The party is projected to win about 150 seats, just one short of an absolute majority, though officials say that number could change. The ruling New Democracy party is projected to come a distant second. Syriza’s Alexis Tsipras has pledged to renegotiate Greece’s debt arrangement with international creditors. He has also vowed to reverse many of the austerity measures adopted by Greece since a series of bailouts began in 2010. PM Antonis Samaras has admitted defeat and phoned Mr Tsipras to congratulate him. “The Greek people have spoken and I respect their decision,” he said during a news conference., pointing out that he had inherited a “hot potato” on coming into office and that he and his party had done much to restore his country’s finances. Earlier, exit polls indicated that Syriza took between 36% and 38% of the total vote, with the ruling New Democracy party a distant second with 26%-28%. “There is an ongoing thriller surrounding the absolute majority,” said Michalis Karyotoglou, head of Singular Logic, the software group monitoring the voting process for the interior ministry. 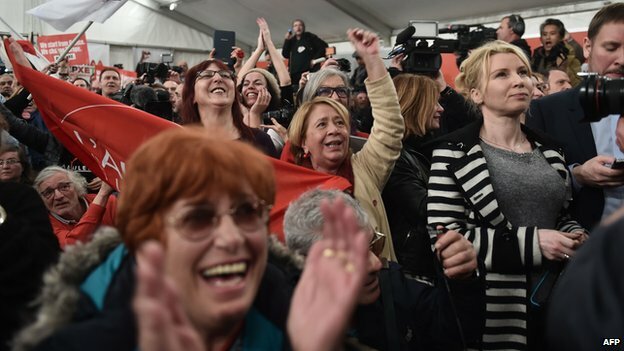 Syriza hailed the exit polls as “a return of social dignity and social justice”. “What’s clear is we have a historic victory that sends a message that does not only concern the Greek people, but all European peoples,” spokesman Panos Skourletis told Greek television. Far-right Golden Dawn and centrist The River came joint third in exit polls. The proportion of votes won by smaller parties will have a large impact on whether Syriza can gain the required 151 parliamentary seats to have an absolute majority. 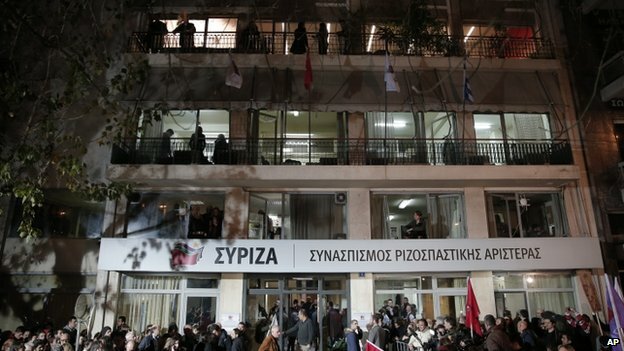 Who are Syriza and what do they stand for?